The landscape for technology has developed at a rate that is much quicker than people thought it would. With this new landscape, comes new technologies, especially the addition of laptops, mobile phones, and tablets in all office spaces around the world. Because of this, employees and users need more access from as many different outlets as possible to meet their growing demand. 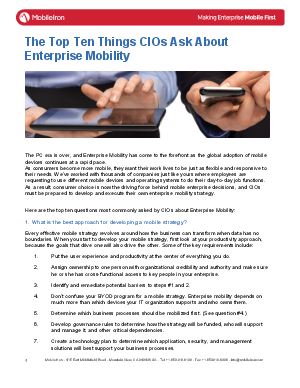 Download this whitepaper to learn the top 10 questions that CIOs should be asking about enterprise mobility and see how an effective mobile strategy will transform your business when data has no boundaries.